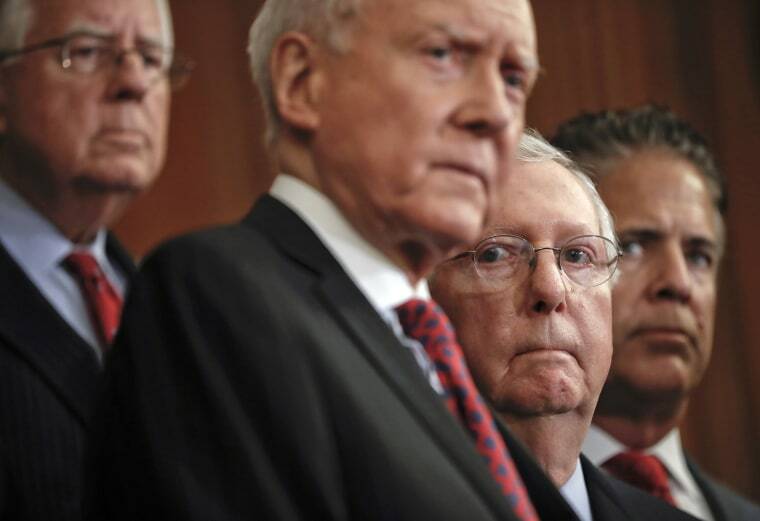 WASHINGTON — Republican frustration with Senate Majority Leader Mitch McConnell has intensified since last week's failure to pass a repeal of the Affordable Care Act, but his GOP Senate colleagues, desperate for a legislative win, are giving him a pass and vowing to pass tax reform. McConnell has become the target of criticism for many in a party that continues to struggle with its governing majority. The GOP leader has faced a series of high-profile defeats in recent weeks. The Alabama candidate he backed, Sen. Luther Strange, lost a primary to a bomb-throwing Republican who has been kicked off the state judicial bench twice for defying the law. And he watched President Donald Trump cut a deal on government funding and the debt ceiling with his Democratic counterparts in Congress. But it's his failure to pass an Obamacare repeal through the Senate that has led some conservatives to raise questions about his future as a party leader. “I think he’s a huge part of the problem,” said Rep. Mark Walker, R-N.C., the chairman of the 150-member Republican Study Committee, noting that if a baseball team loses, the players aren’t fired — the manager is. “There’s a growing consensus that would be very happy if the fine senator from Kentucky called it a career,” he added. While Walker is a member of the House and has no say in whether McConnell keeps his job as Senate leader, his public rebuke is indicative of conservative unease. During an interview on Fox News Wednesday night with House Speaker Paul Ryan, many of the questions were dripping with disappointment over McConnell. Host Sean Hannity complained that McConnell won’t take his calls and that the GOP leader has been unable to get much done in the Senate. McConnell’s Senate conference, however, have been much more muted in their criticism. Many Republican senators are upset with the process of Obamacare repeal but aren’t willing to come out and directly blame McConnell. Perdue wouldn’t cast blame, refusing to say if it was McConnell’s fault for orchestrating a closed-door process or if it was the fault of members who held their positions close and didn’t notify the conference of their objections to the proposal. McConnell chose only a dozen senators to craft health care legislation that never went through the appropriate committees and didn’t receive lengthy debate on the Senate floor. Senate Republicans vow to do things differently in this next legislative round. “I’m not going to go through tax reform like I just went through health care where you don’t know what’s in the bill, it’s changing four times and I’m supposed to go defend it,” said Sen. John Kennedy, R-La. Senators insist that their failure to pass health care is motivation to pass tax reform. “I feel very confident about getting tax reform done and I think the inability to get health care over the line is probably giving us a greater impetus,” Sen. Shelley Moore Capito, R-W.Va., said. Republicans are acutely aware of the political stakes of not passing tax reform. An internal memo from the McConnell-backed super PAC, Senate Leadership Fund, alarmingly noted that congressional Republicans have replaced President Barack Obama as the bogeyman for rank-and-file Republican voters. McConnell is not the only face of the Republican conference but he's currently the focus of most of the frustration within the party. Speaker Ryan has taken his share of criticism from conservative media and even from some of his colleagues who have quietly expressed their disappointment with him. But, they say, he at least managed to pass Obamacare repeal in the House. “The House was able to get (the repeal of) Obamacare passed. We have another 250 pieces of legislation that is sitting in the Senate on Mitch McConnell’s desk right now. I guess the big difference is Speaker Ryan is getting things out of the House but Mitch McConnell is not getting things out of the Senate,” Walker said. While senators have political motivation to pass tax reform, it will not be easy and McConnell will once again be in the middle of it all. When more details emerge, “every high-priced lobbyist known to man is going to be invading the Capitol,” said Sen. Bob Corker, R-Tenn.
“Again, I’m all for us showing the intestinal fortitude to get it right, but when people say tax reform is easier than health care reform, I say not so,” Corker said.